Life is full of serendipity. Here is a compilation of all the quotes that found me throughout the morning. Some were on teabags. Others were on email signatures. One was found on a poster. All are awesome. "Truth is the only safe ground to stand upon." "Love is not love which alters when it altercation finds." "The dictionary is the only place where success comes before work." "Every strike brings me closer to the next home run." "The goal of education is the advancement of knowledge and dissemination of truth." 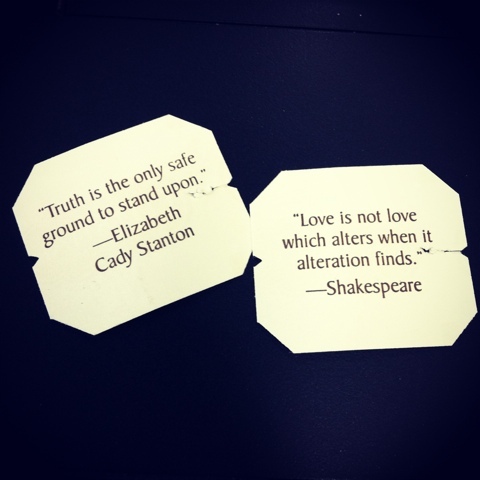 Quotes found on the tags tied to tea bags. Join the conversation. Be respectful. Be polite. Why Do People Love Holding Babies? Like Coffee? Ice Cream Too? This is PERFECT for You. Keep Moving Forward, No Matter What! Happy 94th Birthday Nelson Mandela! Follow @nourishnotes on Twitter. Travel theme. Theme images by andynwt. Powered by Blogger.